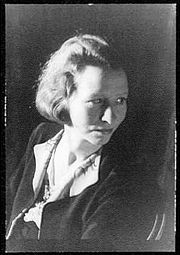 Edna St. Vincent Millay (February 22, 1892 – October 19, 1950) was a lyrical poet and playwright and the first woman to receive the Pulitzer Prize for Poetry. During her own time, Millay was almost as famous for her unusual, Bohemian lifestyle and opinions on social matters as she was for her actual poetry. During much of her career she lived the life of a minor celebrity. In time, however, critical estimation of her poetry has caught up with her celebrity, and in recent decades it has become increasingly clear just how important Millay is for the history of early twentieth-century American literature. Millay lived and wrote during the early decades of the twentieth-century, a period in which the literary Modernism of T. S. Eliot and Ezra Pound dominated American poetry. Millay, however, was a distinctly un-Modern poet whose works have much more in common wiht those of Robert Frost or Thomas Hardy; her poetry is always formal, masterfully written to the strictures of rhyme and meter. During her times a number of poets and critics argued fiercely over the form poetry should take in the rapidly changing times of the twentieth-century; Millay, for her part, was not particularly vocal in these debates, because her works speak for themselves. Millay proved that the old forms could retain their validity in a changing world. Her sonnets are often considered to be the finest written in the twentieth-century, and her short, lyrical poems are unrivaled for their elegance and musicality. Millay's influence extends to a number of poets of the latter twentieth-century, Elizabeth Bishop notably among them. Millay's poetry provides a glimpse at another form of poetry, full of sweetness and light, that remained stable and clear throughout the turmoil of Modernism. Millay was born in Rockland, Maine, to Cora Lounella, a nurse, and Henry Tollman Millay, a schoolteacher who would later become superintendent of schools. Her middle name is derived from St. Vincent's Hospital in New York, where her uncle's life had been saved just prior to her birth. In 1904, Cora officially divorced Millay's father for financial irresponsibility, though they had been separated for some years prior. Struggling financially, Cora and her three daughters, Edna (who would later insist on being called "Vincent"), Norma and Kathleen, moved from town to town, counting on the kindness of friends and relatives. Though poor, Cora never traveled without her trunk full of classic literature — including William Shakespeare, John Milton, and more — which she enthusiastically read to her children in her thick Irish brogue. Finally the family settled in Camden, Maine, moving into a small house on the property of Cora's wealthy aunt. It was in this modest house in the middle of a field that Millay wrote the first of the poems that would catapult her to literary fame. At Camden High School, Millay began nurturing her budding literary talents, starting at the school's literary magazine, The Megunticook, eventually having some of her poetry published in the popular children's magazine St. Nicholas, the Camden Herald and, significantly, the anthology Current Literature, all by the age of 15. Millay's literary reputation was significantly damaged by poetry she wrote in support of the Allied war effort during World War II. At the time, support for the war effort was very unpopular among artistic circles, and Millay never fully regained her prestige among her literary peers. As the critic Merle Rubin noted: "She seems to have caught more flak from the literary critics for supporting democracy than Ezra Pound did for championing fascism." In 1923, she married Eugene Jan Boissevain, then the 43-year-old widower of labor lawyer and war correspondant Inez Milholland. Boissevain greatly supported her career, taking primary care for domestic responsibilities. They lived in Austerlitz, New York, at a farmhouse they called "Steepletop." Pleasantly removed from the hustle and bustle of New York City, Millay wrote a number of her best poems at Steepletop, most notably her sequence of sonnets, which were apparently inspired by a brief affair Millay had with a young poet by the name of George Dillon. Millay's marriage survived the affair, and by all accounts she and Boissevain lived contentedly together to the end of their days. Boissevain died in 1949 of lung cancer. Millay was found dead at the bottom of the stairs in her house on October 19, 1950, having apparently broken her neck in a fall. ↑ 1.0 1.1 Epstein, Daniel Mark (2001). What Lips my Lips Have Kissed: The Loves and Love Poems of Edna St. Vincent Millay. New York: Henry Holt. ISBN 0805067272. History of "Edna St. Vincent Millay"
This page was last modified on 25 September 2017, at 19:39.